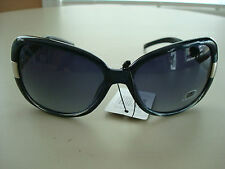 ALL OUR SUNGLASSES HAVE LENS THAT BLOCK 100% HARMFUL UVA AND UVB RAYS. (Black plastic front around lens / Silver logo / Tan colored arms with silver spots on arms / Lens have a purple tint and are darker at the top and lighter at the bottom. for every pair ). (Black plastic front around lens / Silver logo / Peach colored arms with silver spots on arms / Lens have a purple tint and are darker at the top and lighter at the bottom. for every pair ). 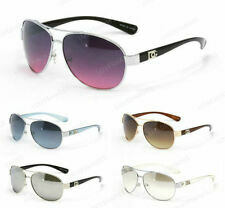 2 Black, 1 Clear Tinted, 1 Blue Tinted, 1 Burgundy Tinted, 2 Tortoise, 2 Mirrored, 3 Brown. Quantiy 1 = 12 Pairs. If you have any problem, we are very glad to help you. Protection: Our sunglasses will take good care of your vision protecting your eyes from harmful sun rays. These sunglasses feature UV400 Lens Technology, absorbing over 99% of harmful UVA and UVB spectrums. Real Sunglasses look better than picture. It's hard to show the Rhinestons in the picture. Big, Square. If you have any problem, we are very glad to help you. 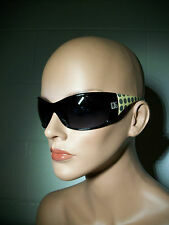 DG Fashion Designer Sunglasses. It normaly takes 1-3 weeks, But we have seen it take up to 4 weeks.